Chicago, IL – Brenda Palms-Barber has created a unique program that accomplishes two noble goals—helping troubled honeybee populations and helping ex-cons stay out of jail. 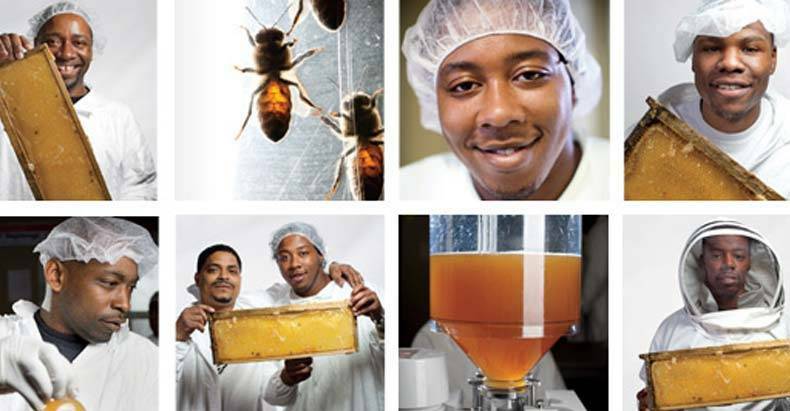 Sweet Beginnings, located in Chicago’s West Side, is a social enterprise business that turns former prisoners into beekeepers. This interaction with some of our most important friends in the natural world has a striking success rate. The company does not even have enough jobs to satisfy the hundreds of people that show up asking every month. But Palms-Barber is looking to expand on the concept with a franchise model, spreading first to D.C. and Detroit. As of now, the part-time jobs last 90 days, but that is enough to foster inspiration. Jackson hopes to open her own catering company when she is through with the program, using the honey in her food and hiring community members. VonKisha Adams used to run from bees, but now she has affection for the busy critters creating their liquid gold, which contributes to her own newfound motivation to work. While giving ex-cons a purpose, the beekeeping program also teaches about the ongoing problem of colony collapse disorder and the risk it poses to the global food chain. Most of the 400 employees who have worked there were convicted of drug offenses. They work in all parts of the process, from tending the bees to extracting and bottling the products to shipping them to stores. Other parts of the program help them get their lives back on track. The 131 hives of Sweet Beginnings produces delicious local honey as well as other products with a higher profit margin, such as shower gel, lotion, and lip balm. They are shipped around the country but also sell at a local supermarket chain and about 10 Whole Foods stores. This incredible venture is providing much-needed aid to increasingly beleaguered honeybee populations and promoting the vitality of agriculture. The fact that it sharply reduces recidivism is equally important. Sweet Beginnings also shows the value—both monetary and spiritual—of creating something under a free market approach.